You finally decide you’re going to tackle that kitchen remodel and you want it done in time for Thanksgiving. The contractor you meet with looks thoughtful and says, “Your project is going to take 3 weeks and cost $20,000″… and then you wake up. We’ve all seen the TV shows. Much as I love them, reality shows do a disservice to homeowners in terms of setting unrealistic expectations about what it takes to create your perfect space — both in terms of time and cost. I had the chance to see the Property Brothers speak at an industry conference awhile back and found them not only engaging and insightful… but completely honest! One of the first things they said was “Our shows are not reality”. They went on to explain they don’t charge for their time, most of the materials are donated and a lot of the shows are shot in locations where the cost of living is vastly different from ours. So where else does reality lie? Design comes first, then construction. Thoughtful design takes time and needs to be finalized before anyone starts pulling out your cabinets. We’re frequently asked, “Can’t you give me a ballpark cost?” We can certainly give you a range, but think of it as car. Want the heated seats, sunroof and rear view camera? That adds to the final cost. Until any remodeler knows if you want the high end appliances, the radiant heating or the custom cabinets, there is no way to give you an accurate cost until you’re further along in the design process. You’ve finalized the design you want, now it’s time to order materials. Quality cabinetry alone can have a 6-8 week lead time. This is where many remodeling projects start to fall off the rails. Your kitchen or bathroom has been torn out, and you are suddenly told the tile you want won’t be delivered for another 4 weeks. No-one should be swinging hammers in your home before they’ve finalized the design or ordered the materials. We have a saying at Synergy, “materials wait for construction, not the other way around.” The contractor you pick should be able to tell you exactly when the construction phase of your project will start and exactly when it will finish. If any contractor comes through your front door now promising to complete your remodel by Thanksgiving, that’s great and depending on the size and scale of the project, perhaps it will. But do your homework and make sure it’s not just a tactic to get you to sign on the dotted line. The last thing you want is to be taking down your Christmas decorations and they still haven’t finished the job. 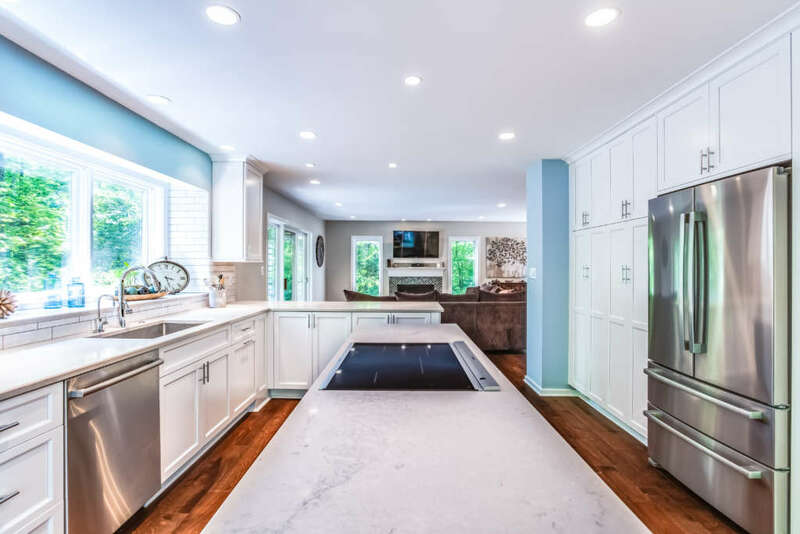 This month’s remodel features a single family home remodel in Reston. Our clients wanted to completely open up the space to create a better flow and a more cohesive space. They put their trust in us to deliver the final project on-time and on-budget and that’s exactly what we did! Find out more about our approach to remodeling. Not ready to remodel and just want to keep in touch? Sign up to receive information directly in your inbox!